On my final day of a business trip last year to the Marine Corps Base Camp Pendleton, Calif., I was walking along the Oceanside Harbor in search of a place to eat and have a few beers. In the mood for something simple I had hoped to find a small bar that served food and was not too crowded. I came across exactly that—a small bar with maybe six customers inside. Sitting next to me at the bar were three large men of Samoan decent who were laughing and having a good time with the bartender. 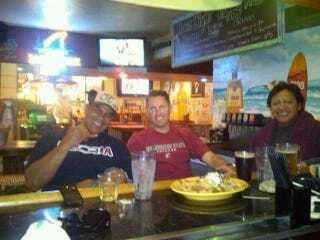 I wasn't sure at first, but then after a double-take it clicked in my head that I was sitting with Junior Seau. He was a monster of a man, wearing a ball cap and all smiles. I couldn't believe that I was sitting next to one of my favorite football players growing up as a kid. The same linebacker that I impersonated for years on all my football video games. After a few minutes, the older of the three Samoan men had asked what I was up to in Oceanside and I had told him that I was a Captain in the Marines headed back to my home station at Camp Lejeune, N.C. Junior Seau interrupted and said, "Wow, man. I really admire what you do. You guys are real heroes." Starstruck for a moment, I didn't know how to respond. Did one of my childhood heroes really just call me a hero? He did indeed, and refused to let me pay for my dinner or any more drinks for the night. I was surprised to find out that Junior Seau was not only a former member of the Patriots, he was an American patriot. Junior then introduced me to the other two men sitting with him, his cousin and his uncle. I couldn't believe how sincerely interested Junior and his family were about my military service. They asked about helicopters, machine guns, parachuting and even expressed gratitude towards military families and specifically spouses for enduring such hardship during a time of war. After a couple of hours of talking, Junior then began to brag about his musical talent. That he had sat "first chair" in his high school band and that was something most people didn't know about him. I called him on it and he was up to the challenge. Junior said, "You sit right there, Captain, I'm gonna go to my car and get my ukulele. We're gonna spread some joy around here." I didn't know it at the time, but over the next two hours the way in which I look at football players would be changed forever. Junior returned to the bar with his ukulele and started to play. The tune from "Brown-Eyed Girl" was coming from Junior's ukulele at it was surprisingly good. Then, he started to sing ... and he was amazing. One of the most ferocious tacklers in the history of football was playing a ukulele in an empty bar at 11:00 p.m. and serenading the few that remained. He then started to play some more and his cousin and uncle joined in the chorus. They were a harmonic family full of melodies ... and they were good—real good. We sat there for another two hours, talking, listening to Junior and his uncle play the ukulele and having a good time. Time and again, Junior thanked me for my service and reminded me how proud he was that his hometown was in the heart of Marine Corps territory, just outside Camp Pendleton. I tried to remind Junior that I was the one that was thankful for the evening. That I was amazed at how real of a person Junior Seau was and not just No. 55 on my television screen on Sunday afternoons. Junior Seau was a man of smiles, laughter, family, respect and he loved his country. It's troubling to hear of the passing of another great NFL football player at an age so young. But I'm especially sad to hear that it was Junior Seau who had passed. A man who for one evening last year I had the opportunity to meet and come to admire. The day after I met Junior last year, I began to follow his non-football charity exploits and grew to respect him even further. I hope this story will aid in an attempt to remember not only a linebacker but a fun, loving person as well.